Team development is critical for an organization’s success, but the team leader and team members working together effectively often presents a challenge. Effective and successful teams are essential to an organization’s growth, and mastering successful team development is a key to a team leader’s success. Learn how to develop a successful team. Profiles Team Analysis is the team development tool for building stronger, more effective teams. Thousands of organizations are using Profiles Team Analysis to promote organizational excellence and superior team development. The assessment is a tangible and valuable team development tool to strengthen any work team. Help determine which team members would be the best to lead the team. Knowing more about each team member allows you to task each member with the responsibilities that best fit their unique skills and abilities. 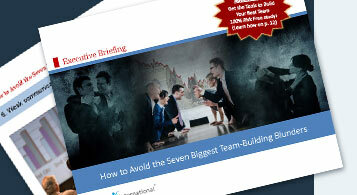 Supply the team leader with a blueprint for team development that delivers maximum results. Help team leaders get the most from every member by evaluating the team’s balance, strengths, and weaknesses. Alert the leader to important areas where the team needs to improve. Armed with this valuable data, the team leader uses the information as a guide to help the team compensate for deficiencies.